I'm going to refer to the sentence "this sentence is false" as P.
Consider pointing to a sentence which reads, "the earth is five days old," and saying P to a colleague. That would be a meaningful statement. So P can be used to make meaningful statements. Perhaps some particular uses of P are meaningless, but then we need to figure out what makes those cases different. And we need some reason to think that they are meaningless in the relevant cases. We might thus suppose that a sentence cannot be used to assert its own falsity, or perhaps sentences cannot be used to make statements about themselves. However, these solutions are too simplistic. We could think of the Liar's paradox as a variety of a trick children sometimes play on each other. They give a friend a piece of paper with the words "turn over" written on both sides. We could write the Liar's paradox this way: On one side of a piece of paper, write "the sentence on the other side of this paper is true," and write "the sentence on the other side of this paper is false." People would react to this game much the way children react to the "turn over" game. For a more interesting variation, we could write "the sentence on the other side of this paper is false" on both sides. There wouldn't obviously be a paradox at first, because we would think that the first side we looked at was true and the second side was false. (We would negate the second side which told us that the first side was false, and we would thereby affirm what we originally thought, which is what is stated on the first side.) But then we realize that we could have looked at the other side first and come to the opposite conclusion about which was true and which was false. So we have a paradox. These are games in which sentences are used to undermine their own functionality--they are used to make assertions which, because of the game in which they are involved, cannot be made later in the game. 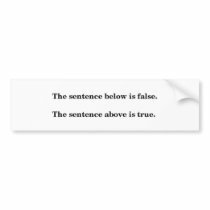 Depending on where we are in the game, the sentence can either be true or false. At no point are they meaningless, however, because we understand them just as the game requires. We might say that it is the game, and not the sentences themselves, which is meaningless, but that doesn't work, because the game works. People can play it with predictable results. In the games, the sentences direct our behavior in meaningful ways and lead us in predictable ways towards notions of truth and falsity. I therefore reject the claim that these sentences are meaningless, nor do I think that they are being used to play a meaningless game. Rather, I think the problem comes from failing to recognize that the truth or falsity of a sentence depends on the game we are playing, and that the truth or falsity of a sentence depends on where you are in the game when you are using it. (*) At least one sentence written on the blackboard in Humanities 105 is false. If (*) is the only sentence written on the blackboard, we have a paradox, but if at least one false sentence distinct from (*) is written on the blackboard, we do not. Surely (*) cannot switch from being meaningful to being meaningless (or conversely) depending on what other sentences we write on (or erase from) the blackboard in Humanities 105? "Perhaps some particular uses of P are meaningless, but then we need to figure out what makes those cases different." Actually, one interesting thing is that, while it's certainly true that sentences like "this sentence is true" and "this sentence is false" can in some contexts be meaningful and unproblematically true or unproblematically false (e.g. if one points to a historical claim written on a chalkboard and says "this sentence is false! "), it's also true that in some contexts they can be uncontroversially meaningless....or, at least, the fact that they are meaningless in these contexts is *far less* controversial than it is in paradoxical contexts. For example, if the sentence written on the chalkboard was "colorless green ideas sleep furiously", or some string of nonsense syllables, and I said "this sentence is true", surely, at least, anyone who accepts the universal intersubtitutivity of P and Tr(P) would have to grant that I've just used the combination of words "this sentence is true" as a meaningless utterance. So given that the sentence can be meaningful (if the "this" is applied to a clearly meaningful sentence) and it can be meaningless (if the "this" is applied to a clearly meaningless sentence), the interesting remaining question is whether the sentence is meaningful when the "this" is intended to refer to the sentence itself. I've provided a reason (in Part I) why I don't think it is meaningful in those cases, and it's a reason that generalizes to cases like the turning-over-the-page example you mentioned, infinite series of sentences that each ascribe truth to the next sentence in the series but never "ground out" in a 'true'-free sentence from which the rest can inherit their meaning. "And we need some reason to think that they are meaningless in the relevant cases." Again, it might be convincing or it might be unconvincing, but I did provide and argue for such a reason, based on the disquotationalist "nothing above and beyond" principle--ascribing truth to "snow is white" is nothing above and beyond ascribing whiteness to snow. The effect of adding "is true" to a quoted sentence is simply to remove the quotation marks. Starting from this (simple, efficient, and to me at least, quite compelling) picture of truth, it seems to me that, if sentences that ascribe truth to some other sentence inherit 100% of their meaning with nothing left over from the sentence to which they ascribe truth, then "orphaned" sentences like the Liar and the Truth-Teller, which never have any 'true'-free sentence from which they can inherit their meaning, are by virtue of this fact meaningless. "We might thus suppose that a sentence cannot be used to assert its own falsity, or perhaps sentences cannot be used to make statements about themselves. However, these solutions are too simplistic." Did you read Part I? Because I did provide a motivation for the view that these particular sentences are meaningless there, and that motivation is one you don't bother to canvass as a possible option. I do think that sentences can't meaningfully assert their own falsity, but this is a principled consequence of a much larger view, which is that meaningful ascriptions of truth (or falsity) must inherit their meaning from the sentences they directly or indirectly ascribe truth to (or their negations). I mostly definitely do not think that "sentences cannot be used to make statements about themselves." "'This sentence has seven words in it.'" "I can see how the solution you've worked out might apply to liar sentences which (seem to) 'directly' attribute falsity to themselves. But what about those that do so 'indirectly'?" Well, it's certainly an unavoidable consequence of my view (and on that I embrace) that it applies to sentences (whether paradoxical or not) that seem to attribute truth or falsity to themselves indirectly, or for that matter directly or indirectly attribute truth or falsity to some other sentence that attribute it to some other sentence that go on forever without ever stopping at some 'true'-free sentence from which the rest of the sentences in the series can inherit their meaning. "(*) At least one sentence written on the blackboard in Humanities 105 is false. "If (*) is the only sentence written on the blackboard, we have a paradox, but if at least one false sentence distinct from (*) is written on the blackboard, we do not. Surely (*) cannot switch from being meaningful to being meaningless (or conversely) depending on what other sentences we write on (or erase from) the blackboard in Humanities 105?" (1) If a lazy and inefficient maintenance person comes in after class and erases most of the words, but happens to leave some, and the remaining words on the chalkboard, by some weird coincidence, add up to the sentence "colorless green ideas sleep furiously", is it a problem that it's contingently meaningless? (2) This is a nit-picky point that doesn't really address the force of the example (which I promise I will get to! ), but there's actually an interesting point here about tense. Of course, if the sentence means "there's at least one sentence that has ever been written on the chalkboard that's false", that's unproblematic. The apparent paradoxicality--and, given my view about truth ascriptions, apparent meaninglessness--rests on the tensed reading, "at least one sentence that is *now* written on the chalkboard is false." Now, if one is a B-Theory about time and denies that the universe includes a real, stance-independent objective property of "nowness", and thus that true tensed sentences can be tenselessly paraphrased, one might argue (using the date theory) that "at least one sentence written on the chalkboard is false", written at 3 PM, really means "at least one sentence that (is) on the chalkbaord at 3 PM (is) false." Or, if one prefers to token-reflexive theory, one could translate it as something more like "at least one sentence that (is) on the chalkboard simultaneously with this sentence being written is false." Either way, no paradoxicality. (3) OK, that said, if one's an A-Theorist--taking sentences to change truth-value over time as the 'now' changes and all that--but accepts my view, then yes, absolutely, an obvious consequence is that the sentence on the chalkboard is now "ungrounded" and thus meaningless. I'm comfortable with that. I think my Jack & Jill case in this post provides a plausible parallel situation--when Jill tests Jack by emitting a string of nonsense syllables and Jack, not paying attention, says "that's true", it's contingent happenstance based on factors outside of his control that he happens to be making a meaningless statement, but it still seems to me that he quite clearly is doing so. Sorry, I somehow overlooked the fact that you had presented that argument in Par I. I didn't read it before posting earlier. What about modifications of the Liar, in which it intuitively seems to become clearly true or false, but still refers to itself by means of the truth-predicate? Examples (with my suggested truth-value in parentheses): "This sentence is obviously false" (false(but not obviously so)), "it has not been shown empirically that this sentence is false" (true). Would you say that these sentences and other like them are meaningless? I just wanted to pop my head in to say that I haven't forgotten about your comments. I got into Korea today (having flown in to start up a visiting professorship at the University of Ulsan), and before that I was swamped with preparations. In any case, given that there have been a couple of posts since one so some interested parties might not be following the discussion back at this post at this point, instead of trying to dash off a quick reply in the comments, I'll devote a separate post next week to following up on the points you two raised.